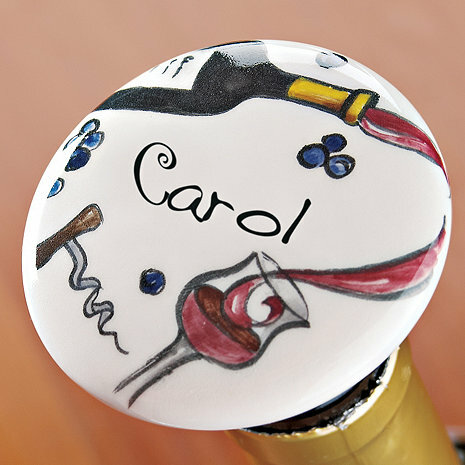 We designed the prettiest ceramic-topped cork stopper in a spirited, hand-rendered motif to appeal to oenophiles and lovers of charming finds alike. Think hostess gifts, holiday stockings, wedding favors, keeping wine fresh with decorative flair. State up to 10 characters. Allow 3 to 4 weeks for delivery. 2" Dia. I would NEVER buy this again. It's cute, but sized inappropriately. Doesn't fit any wine bottle. These were gifts and how embarrasing..